Mitt Romney’s trip to Europe was marred by an outdated understanding of Europe, not gaffes and stupid mistakes. Romney thought he was visiting “New Europe.” But it doesn’t exist anymore. Ignore the gaffes. They’ll soon be forgotten, and they don’t matter anyway. The real problem with Mitt Romney’s trip to Europe wasn’t that he sounded less than convinced about the London Olympics or that he gave short shrift to Palestinian culture. The problem was that the very idea of this particular trip—where he went and who he met, at least in Europe—was based on an outdated and increasingly misleading narrative about U.S. foreign policy. In Britain and Poland, at least, Romney appeared to think he was paying visits to allies who are deeply disappointed by Barack Obama and who long for a return of American leadership in the form of a new George W. Bush—or, even better—a new Ronald Reagan. He imagined he would find soul mates in the British Tory party, just as Republicans used to do long ago. He imagined that Poles, freshly released from communism, would all thrill to a speech about John Paul II, Solidarity, Lech Walesa, and the Cold War. He was wrong. Yes, many abroad are disappointed with Obama, and yes, this administration has made a number of awkward mistakes with Europe, and with Poland in particular. 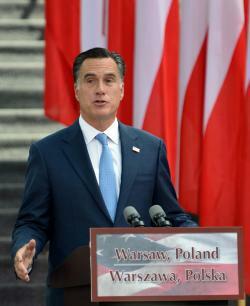 Yes, those Romney met—again, Poles in particular—were flattered that he came, and they appreciated the speech. Contrary to media reports, he made a good impression on the politicians he met, everywhere. But Romney, or perhaps his advisers, doesn’t seem to realize that the disillusionment with U.S. leadership in Europe isn’t solely the product of the current administration. “New Europe”—the British, the Spanish, the Italians, the Central Europeans, the pro-American “coalition of the willing,” the countries that supported the U.S. invasion of Iraq in defiance of France and Germany—was a concept that fell apart a few years after its formation. Having attained the support of these allies in 2003, the Bush administration, not its successors, ignored them, failed to reward or acknowledge them, and then bungled the Iraqi “occupation” so badly that they all suffered political setbacks at home. Tony Blair’s loyalty to the United States in Iraq is remembered, in Britain, as a great stain on his record, not as a moment of triumph and glory. The U.S.-Polish negotiations over the missile defense program are remembered for the broken promises made in the Bush years as well as more recent policy changes. Full disclosure: I am married to the Polish foreign minister. But I wouldn’t need to ask him about this disillusionment, because it’s been all over the Polish newspapers for years. Indeed, they aren’t interested in any of the rhetoric that gets thrown around during American election campaigns, because it doesn’t really matter. Everyone knows that a new president will eventually change his tone—as Clinton did, as Bush did—whether it takes one year or four. So yes, there is disappointment abroad with Obama. But it doesn’t matter as much as Romney’s campaign team thinks.